I did it. I got Mac OS X installed on my Dell Vostro 1310 and I am loving it. A few months ago I accidently erased Windows XP from my computer. Good thing I had backed up to Amazon S3 (using Dragon Disk) before so I didn’t lose all of my files. Anyways, instead of re-installing windows I decided to try to use a linux distribution. So I did and I used PCLINUXOS. The installation went well enough and I was off and running. PCLINUXOS was fine but there were some things that just didn’t work. I also thought my computer was able to operate faster than PCLINUXOS had it moving. I used the linux distribution for a few months then it started acting up. So I bought an external HD (WD Elements desktop external HD 2TB) That offers a ton of memory. More memory than I need, but I feel good having it. I moved all of my files onto the external drive and decided to re-install windows xp. I must have spent 4 hours trying to install windows xp on the laptop it originally came with. It didn’t work. It was soooo frustrating. I decided I wasn’t going to stress myself out and decided to try and install Mac OS X Leopard on my Dell. That was the main reason I’d gotten the Vostro. I’d read I could install Mac. I followed this guide exactly and watched this video on youtube and it worked exactly as it said it would. You don’t know how rare that is. For something to work just like they said it would. Anyways, I had to install it twice. When I installed it the first time, I’d just use a portion of my hard drive. When I saw how well Leopard worked on my Dell, I decided to erase my entire hard drive and use the entire thing. Once again everything went smooth. I was so excited, I couldn’t sleep. I had a really fast, great working laptop with Mac OSX Leopard on it. I loved it. Everything just works and fast. Pretty much everything (bootcamp assistant dosen’t work). I can’t imagine a mac performing better. Plus I’m working on a 1.8 GHz Intel Core 2 Duo with 2 GB of memory. Most computers today are faster. For Email I downloaded Thunderbird, For Office I downloaded Open Office all free. Now I needed to use Windows XP for work. 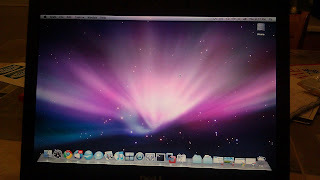 After trying to install Parralels Desktop (which didn’t work), I installed VM Fusion . It installed right away with no problems. I then used my Windows XP installation disk I got with my laptop to install Windows XP. Everything went really smooth. Just follow the directions on the screen. But then Windows wanted me to activate my edition. It wouldn’t take the product key I had on the sticker on my computer because it was a vista product key (I’d gotten vista pro with the XP Professional downgrade). I called Dell and they told me the product key exists on the motherboard and there was no way for them or me to get it. The customer service rep said, because I was installing windows XP in a virtualization enviornment (VMWARE) the program was unable to read my hardware properly and was unable to register my copy of windows. After a few hours I was able to register my copy of windows XP and I’m up and running. I am giddy right now. Welcome back Mac, without spending thousands of dolalrs. I forgot how much fun computer could be.